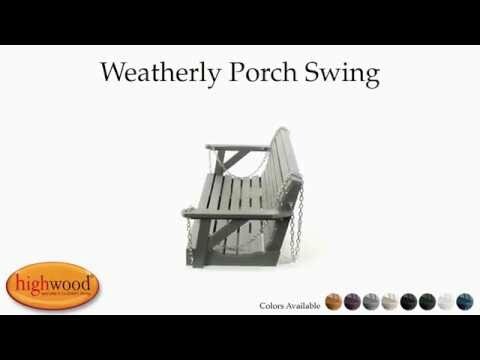 This Porch Swing is extremely popular from coast to coast and is part of the Weatherly Collection. It comes in 4ft and 5ft widths and is supplied with a rust-resistant chain so it is ready to hang to a sturdy structure. Please use strong hooks - not provided - to hang the chain from and support the weight of the loaded swing. Extra lengths of chain are available on request for a small fee if required. This product has been load tested, per ASTM 1561-03 (2008) standard for Outdoor plastic furniture, and has a 500-pound weight capacity. Some assembly is required (see assembly guide). I want to let you know how impressed I am with my new Highwood Weatherly porch swing. Assembly was very easy. My 12-year-old grandson and his friend put it together. My son-in-law hung it under the canopy of my new "she-shed." The Highwood workmanship was excellent and I love the wood look without the maintenance of wood. I am sure I will have this swing for many years to come. I am 100% satisfied. Our new swing compliments the shed nicely. Thank you, Highwood for a fine product! We added this porch swing to our beach home. It’s perfect and was so easy to install. We enjoy using this swing on lazy afternoons at the beach!